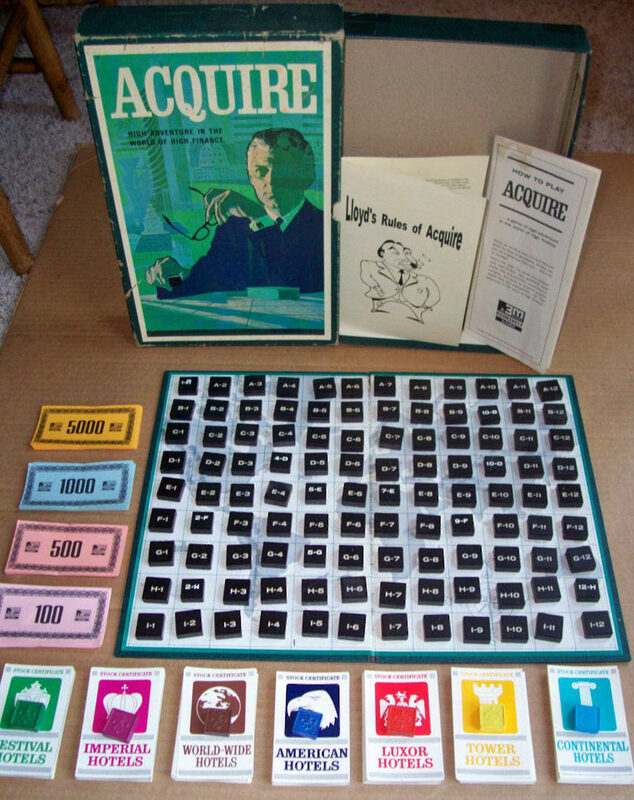 The earliest concept of ACQUIRE, produced by Minnesota Mining and Manufacturing (3M) in December 1963, was played on a board that portrayed a world map. These games were only sold in eight U.S. cities for test marketing and only for a few months. The amount of stock certificates were staggered for each hotel. Continental had 22 shares, Tower 24, Luxor 26, American 29, Worldwide 31, Imperial 33 and Festival had 35. All hotel stocks sold for the same price, starting at $200. 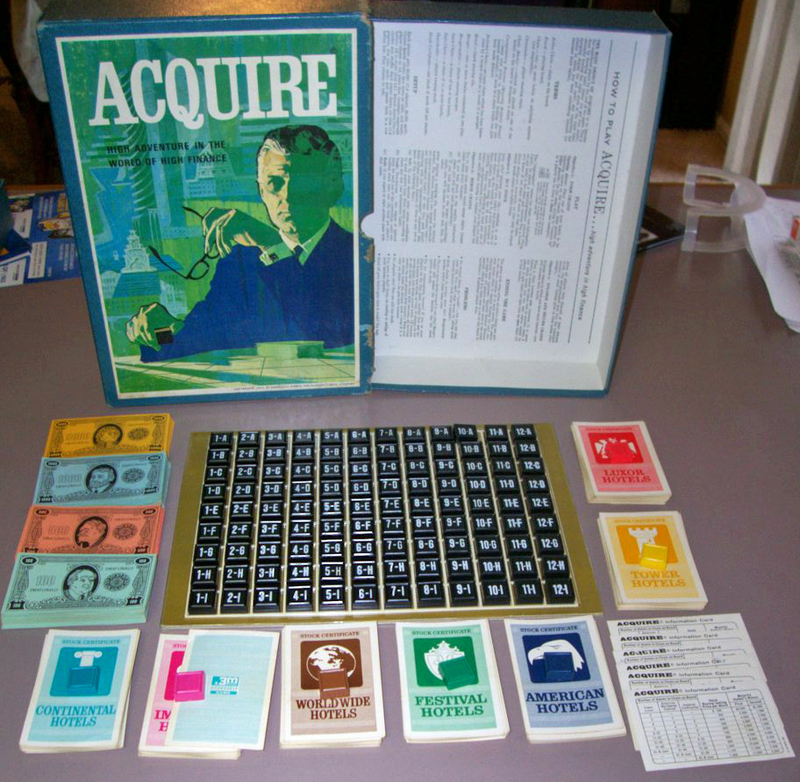 A quantity of 60 stock certificates were shuffled and dealt out to the players before game play. Bonus stocks were not awarded for founding hotels. 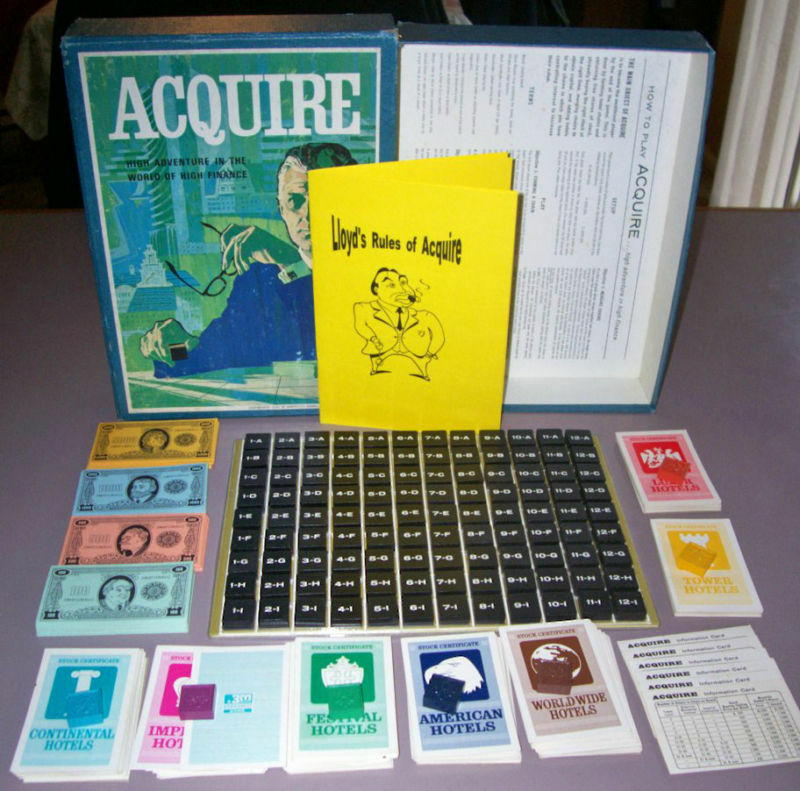 This method of play made it impossible to keep track of other players stock holdings unless the players agreed to disclose their holdings. 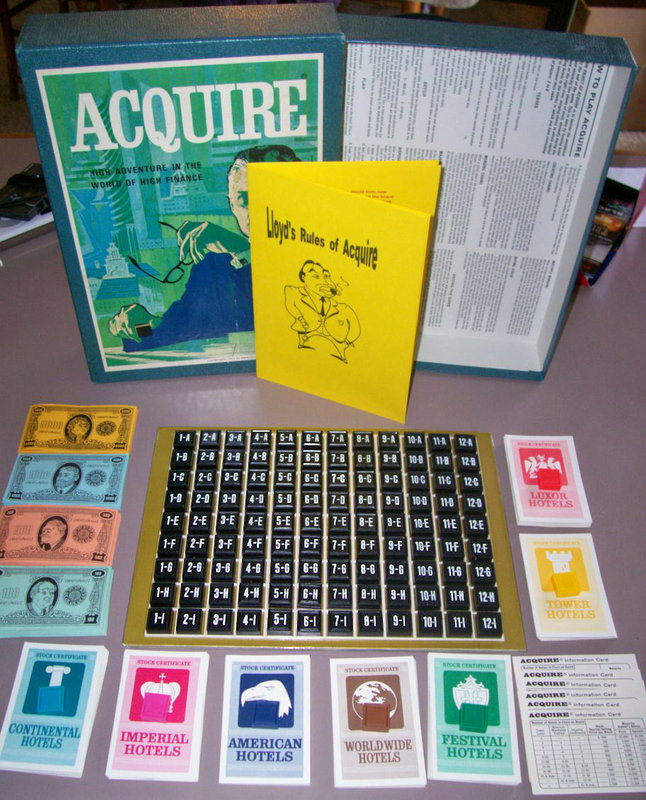 Players could only purchase one stock certificate per turn, which explains why they still put far too many $100 bills and not enough $1000 bills in the later editions. 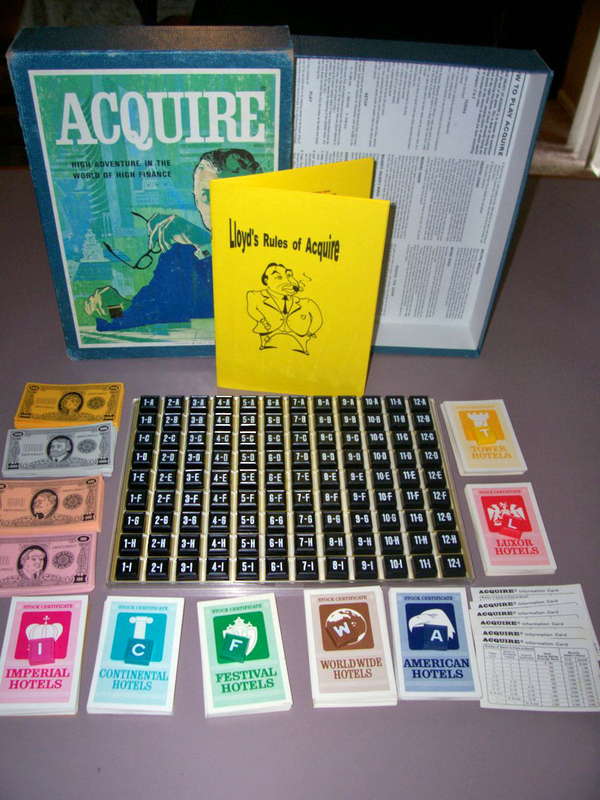 By purchasing only one stock certificate per turn, the player only had to spend a few hundred dollars at a time. Yet now in the later editions, since the players can purchase three stock certificates per turn, the $1000 bills run out far too often. The tiles were made of wood and were slightly larger than tiles in later editions. 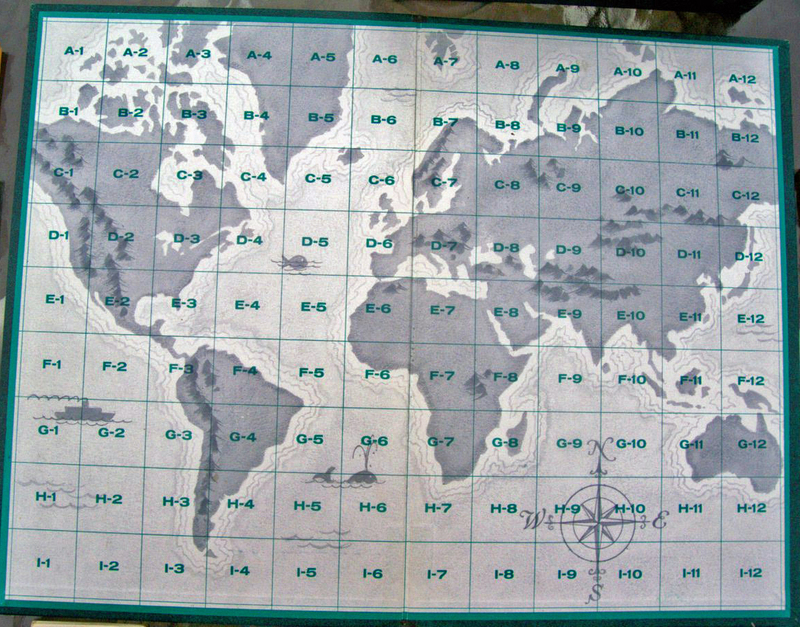 The tile designations were marked with the letter first (A-1 instead of 1-A). The wood tiles had a fleur-de-lis imprinted on the back of the tiles. Due to the size of the board, the tiles do not connect together and with no restraints, they can slide across the board. If these games can be found, they sell for anywhere from $150 to $500. Players could buy three stock certificates per turn and a stock certificate was awarded to the player who founded a hotel. This method of play allowed a better ability to keep track of opponents' stock holdings without discloser. The backs of the stocks were printed with the 3M logo. The hotel markers were colored, but blank on the topside (no letter designation). Wood tile editions can be found for around $50 - $100. 3M soon went to plastic tile versions during those initial production runs. The initial hotel markers in plastic were also colored but unmarked. Both of these versions had $100 bills that were colored green and the $1,000 bills were colored blue. The colors easily caused confusion during game play because of their close similarities. 3M made the next production runs in 1966. 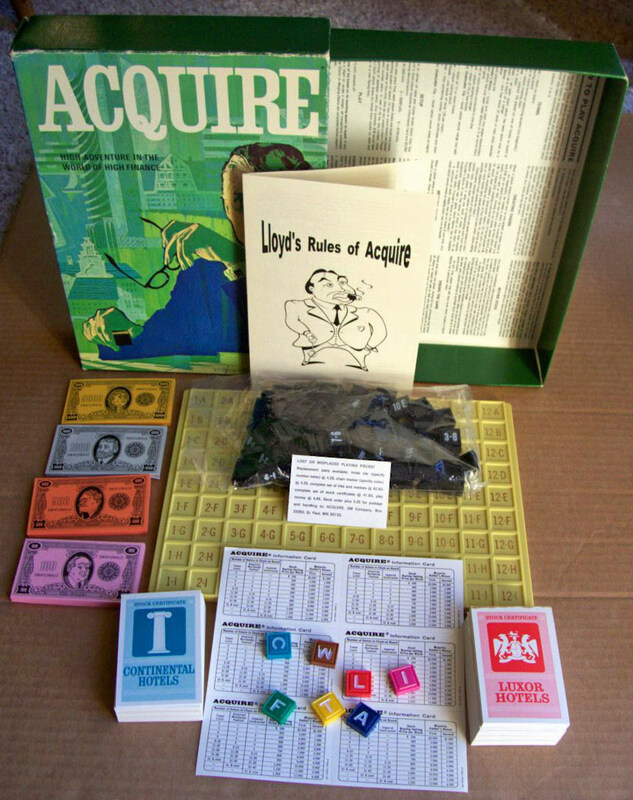 The outer box had a 1962 copyright, while the rules on the inside box were copyright 1966. (See picture as compared to 1962/63 inner box.) The board was the 1962 cardboard/plastic film board. The money was the 1962 version and the hotel markers were unmarked. The main difference in this version is that the stock certificates were not wax coated (possibly a faulty production run). This made the stock certificates susceptible to quicker wear and they were also harder to handle since they didn't slide easily. In 1968 they made a clear hard plastic board with the tile designation printed on a piece of paper that was glued to the back of the board. They started putting this board in with the 1966 inner boxes. In fact, most of the 1966 rules boxes had mixed parts from many different production runs. Once 3M used up its supply of unmarked hotel markers they began to print a letter designation on the tiles and they quickly abandoned the non-wax coated stock certificates. In 1968 and 1971, 3M created a hard plastic board that had a yellow background with black letters for extended durability and better readability. The color of the $100 bills was changed to pink and the color of the $1,000 bills was changed to gray, which made them easier to tell apart. Yet they still didn't adjust to the aspect of buying three stock certificates by increasing the amount of $1,000 bills and decreasing the amount of $100 bills. It is very easy to run out of $1,000 bills during game play while at the same time using less than half of the $100 bills. 3M also put out a "Green Box" edition in 1971 that printed the artwork into the box instead of using a sticker laid over the box. The dominant color of the outer and inner box was green instead of the traditional bluish color. 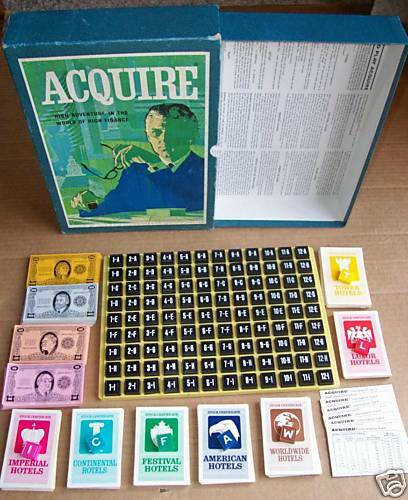 After their production runs in 1971, 3M sold the rights to Avalon Hill.